Let’s start. I have created a new solution in Visual Studio 2012 named DbContextQueryData and added a class library project named Model. This Domain Model project has at the moment the following two classes, Professor and Course. Each professor can be assigned with many courses while each course can be assigned in only one professor (One-To-Many relationship). The relationship between these two classes will be required. Continue by adding a new class library project named DataAccess. Install Entity Framework from Nuget Packages Manager and add a reference to the Model project. I have added a configuration class file named ModelConfigurations.cs where I declared the Code First Configurations for the model classes, using the Fluent API. Next, create a new class file named UnivercityContext and paste the following code, in order to let Entity Framework know about our classes. Finally, I have created a new class file in the DataAccess project again, to ensure that each time you run the application the database will be re-created and seed with some mock data. It’s time to start queering data through UnivercityContext class. Add a new console application project named UnivercitySecretary, add to it references both for the Model and the DataAccess projects and finally make sure you install the Entity Framework too. Modify the Program.cs file to print all available professors as follow. Set the console application as the start up project, build and run your application. By the time you run your application, when it’s time to retrieve all professors, the database will be created and filled with the seed data. All professors should be displayed in the console. 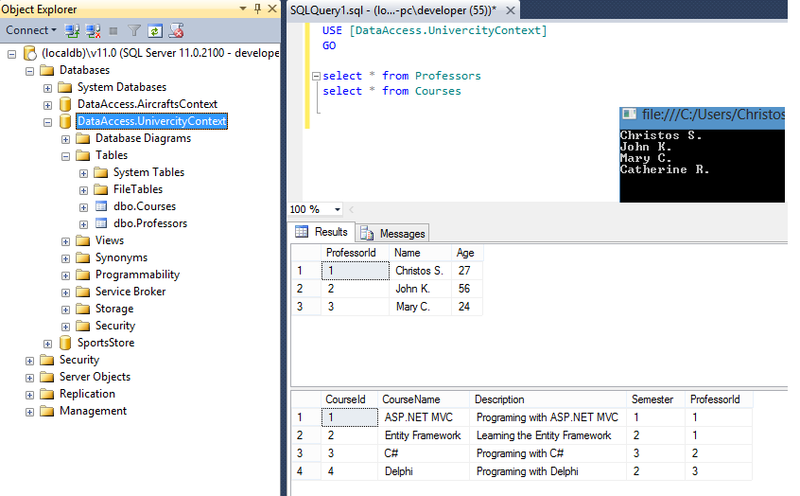 Mind thought, that in the way DisplayAllProfessors is coded at the moment, professor records are retrieved from database on demand (when needed) while iterating, which means a different SQL query is sent to the database for each professor. To retrieve all professors at once, change slightly the DisplayAllProfessors as follow. 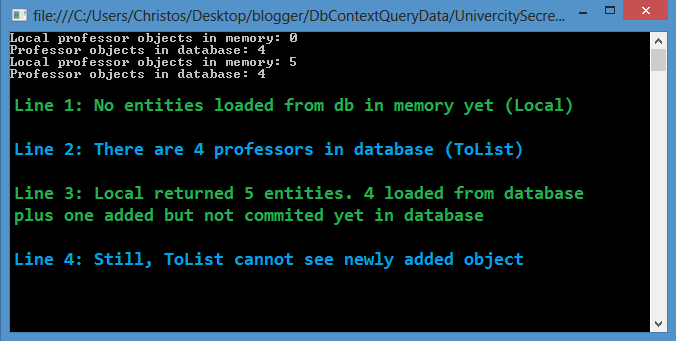 Using ToList() function, will cause to fill professors with all professor records at once. Sorting retrieved entities is quite easy using LINQ. Add the following function and call it in your main method to get all professors ordered by name. Again, each result is retrieved as needed from the application. You could replace the query code to get all professors ordered by name at once, as follow. You can use the Where LINQ clause to filter retrieved results. For example, assume you want to get all professors with AGE < 30. In the previous examples, we retrieved professor objects but all we wanted was to display their names. So why querying all of their data when we can get-project just those we want? Instead of requesting a collection of data, some time you will only need to get a single entity. You can use the DbSet<Entity>.Find method to retrieve a record based on it’s key. If the entity is not found Null value will be returned. In the following example we will try to get two Entities, one with ID=2 and another with ID=8. The second one should return null value. Mind that Find method will look for entities loaded in memory from database, objects added in the context but not saved yet in database and finally in the database. You use the Find method to find an entity based on it’s key but what if you want to retrieve a record based on another property? You can use the Single or the SingleOrDefault methods. The difference between them is that the second one will return null value if record not found while the first one will raise an exception. Both will raise an exception if two rows found. Assuming we want to get a professor with AGE=27..
DbSet class has a property named Local that returns the in-memory data. What this means is that it will return all data loaded from database plus those that were added but yet not committed to database. To make this clearer we will code an example where we’ ll use the ToList function which always gets data from database in contrast with the Local property. We usually use the Local property that returns a collection after we have loaded entities from database. We saw how we can iterate through a DbSet in order to query records from database but there is another way to load data into memory at once. Using the Load method. That’s it for now. We have seen lots of interesting things on querying data with DbContext and LINQ. What’s coming next is even more interesting cause we are gonna see how to get related data and how to insert, update and delete entities. I hope you have enjoyed the post. Download the project we created from here. how can i retrieve all the entity from any dbcontext?